According to the World Bank statistics on GDP per Capita of individual countries, Maldives has shown significant improvement in the growth of its annual GDP per Capita. Annual GDP per Capita increased, on average, by US$ 198 (MVR 3050) during the 30 year of President Maumoon Abdul Gayoom's presidency. 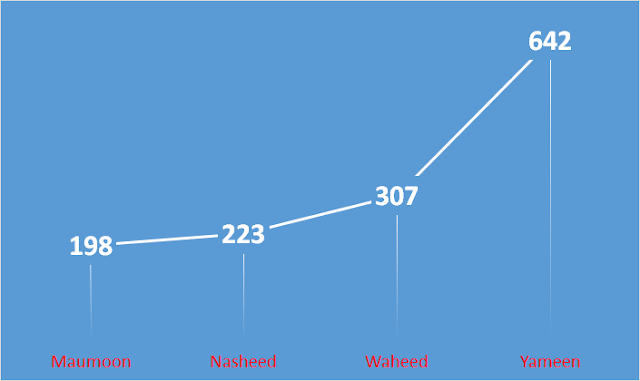 President Mohamed Nasheed's 3 years in power had contributed, on average, US$ 223 (MVR 3439) per annum. Under Mohamed Waheed Hassan Manik's 2 years of ruling, first year (2012) was almost stationary but significant spending for 2013 election led to growth of GDP per Capita, on average, by US$ 307 (MVR 4734) under his rule. Under President Abdulla Yameen, the annual GDP per Capita had increased, on average, by US$ 615 (MVR 9483) per year.